NB: Linked in this Friday's Forgotten Books. 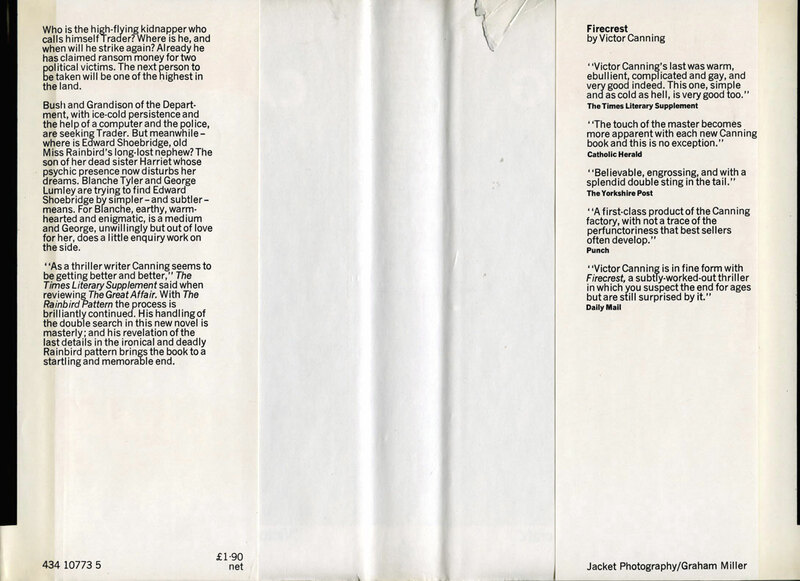 The Rainbird Pattern, published in hardback by Heinemann in 1972, dust jacket photography by Graham Miller (whose distinctive photos also appear on the wrappers for the British first editions of Patricia Highsmith's Ripley's Game, Elmore Leonard's Fifty-Two Pickup and The Hunted – and in the Existential Ennui British Thriller Book Cover Design of the 1970s and 1980s gallery, natch). Winner of the Crime Writers' Association Silver Dagger in 1973, on publication the novel was reviewed in glowing fashion in The Sunday Times ("Mr Canning has never done better"), The Sunday Telegraph ("Bang-on background and characterisation"), The Times ("The sheer imaginative weight holds you like a giant electro-magnet"), The Guardian ("Unputdownable, multi-threaded thriller"), the Oxford Mail ("There hasn't been a better thriller this year"; I suspect Anthony Price was responsible for that review) and many other papers, while more recently Victor Canning authority John Higgins has called it Canning's "masterpiece" and "one of the best thrillers ever written". 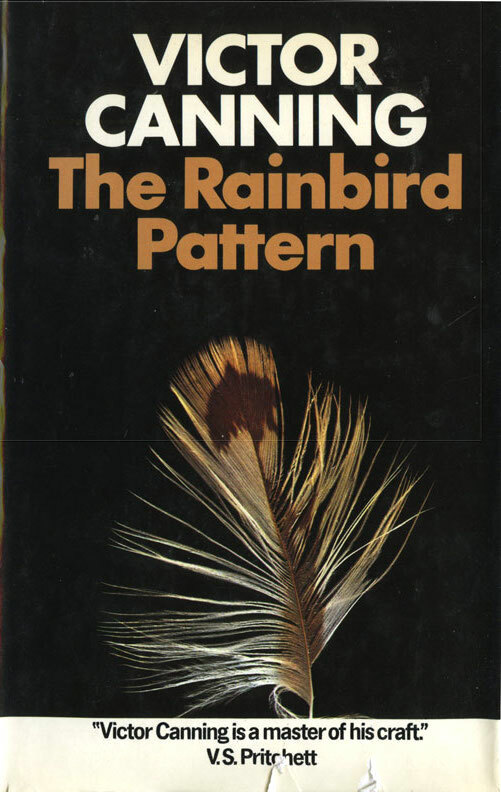 Higgins has also identified The Rainbird Pattern as the second in Canning's eight-book sequence of "Birdcage" thrillers, all of which feature to a greater or lesser degree operatives of a shadowy government dirty tricks department known simply as the Department in the first book in the series, Firecrest (1971), and as Birdcage in later books (the department is based on London's Birdcage Walk). Mind you, there's nothing in The Rainbird Pattern itself to suggest that it is part of a series; though a department along the lines of and with similar functions to the one in Firecrest does play a role in proceedings, its chief – the pirate-like Grandison – and its agents – dour, driven near-divorcee Bush and Deputy Head Sangwill – are not the same as those in the prior novel (although given how Firecrest turned out that's perhaps understandable), plus it's denied a capital "D" in its title. Moreover, it seems somehow smaller than its forerunner, and in a more concrete sense doesn't feature as heavily in the narrative. The story is driven for the most part by Blanche Tyler, alias Madame Blanche, a buxom, cheerful thirtysomething psychic who, with the aid of her underachieveing and overweight boyfriend, George Lumley, and her spirit guide, Henry, is intent on easing the guilt of wealthy spinster Miss Rainbird, and in the process hopefully feathering her own nest (Blanche has plans to build something called the Temple of Astrodel). Meanwhile a kidnapper known only as Trader has been holding a succession of prominent Members of Parliament to ransom and is building up to one last showstopping abduction – unless Bush of the department can identify him and bring him to a very rough form of justice. The audacious manner by which Canning brings these two strands together is, I suspect, a big part of why the novel is held in such high regard – that and the author's trick of invoking a measure of sympathy for each character, no matter how underhand their actions or methods. Whether it be Blanche wanting to build her spiritual temple or George wishing to make a few bob and set himself up as a landscape gardener; or Miss Rainbird, plagued by bad dreams and reluctantly having to make peace with the past; or Grandison and Bush, trying to catch a cunning kidnapper; or even Trader, who, though clearly unhinged, is simply attempting to secure enough funds to find a remote place unsullied by his fellow man's polluting ways – in each instance Canning presents a rounded character with aims which are explicable and in many ways simpatico with those of the novel's other protagonists. Which makes the coldly ironic denouement, and its even icier postscript, a bitterly frozen pill to swallow. 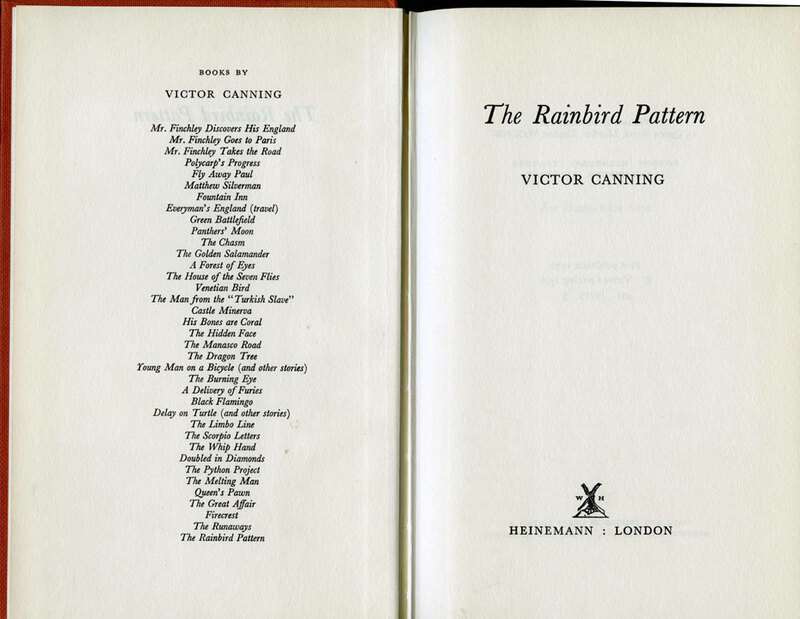 Is The Rainbird Pattern truly Victor Canning's best book? I've read so little of Canning's oeuvre I'm afraid I'm in no position to comment. I only have Firecrest to compare it to and even there I'm in two minds as to which is the better work; Canning's novel conception of the Department is stronger in the first Birdcage book, whereas its (loose) sequel boasts a more daring structure. I do wonder how much of The Rainbird Pattern's higher profile is down to it having been filmed by Alfred Hitchcock – as Family Plot, the director's last film – but one thing it does have over its predecessor is it's currently in print: crime writer and critic Mike Ripley republished it under his Top Notch Thrillers imprint in 2010. I am enjoying your posts about Victor Canning's books. 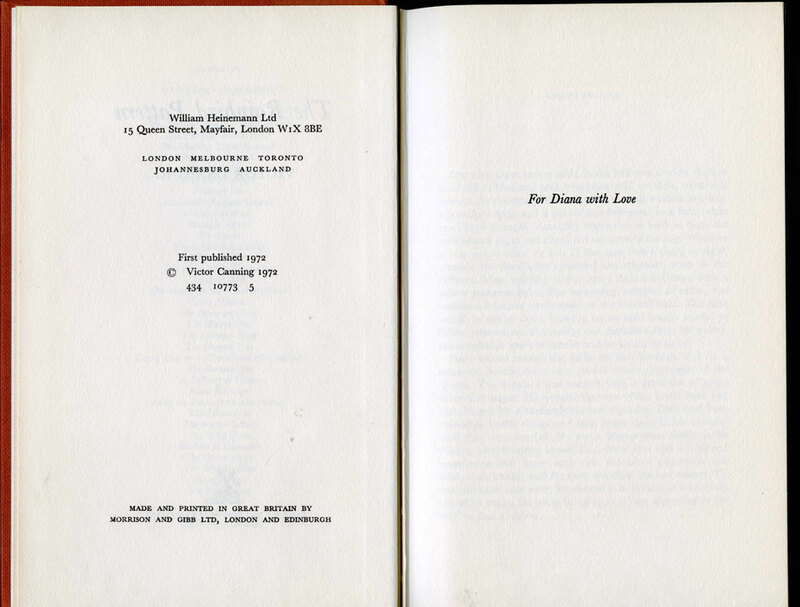 I have only one that I know of, The Python Project, and know little about this author. 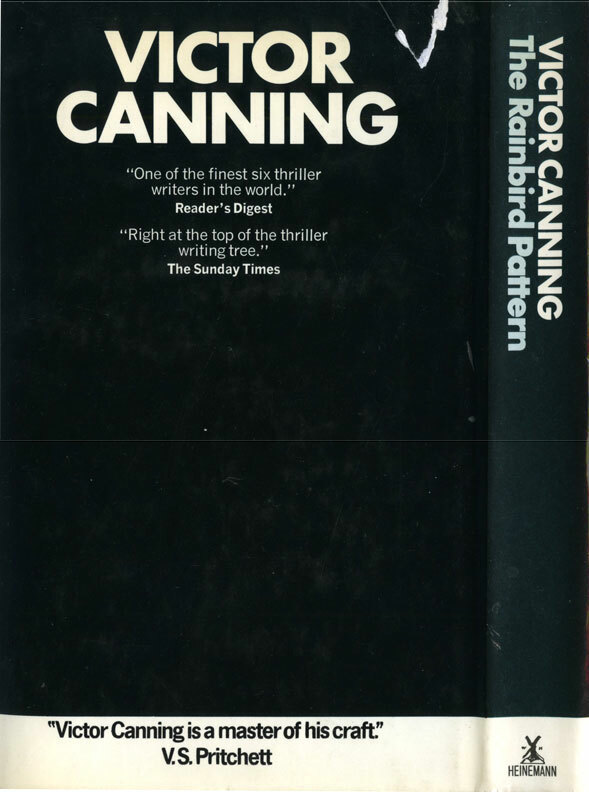 I've not read The Python Project, Tracy, but John Higgins of the Victor Canning pages reckons it's among Canning's best – certainly the best of the Rex Carver series.